My daughter just graduated from high school-WOW! 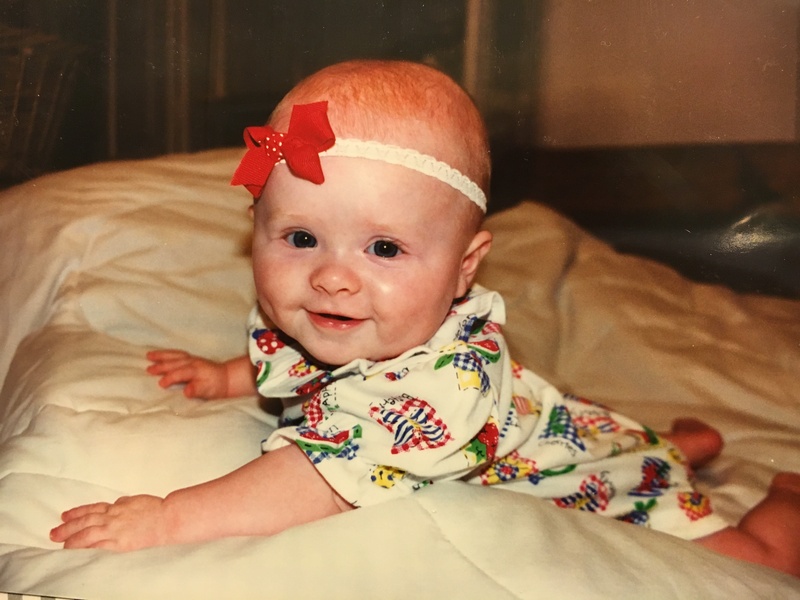 I can’t believe how the time has flown-BLINK-they go from tiny babies in your arms to adults ready to conquer the world! 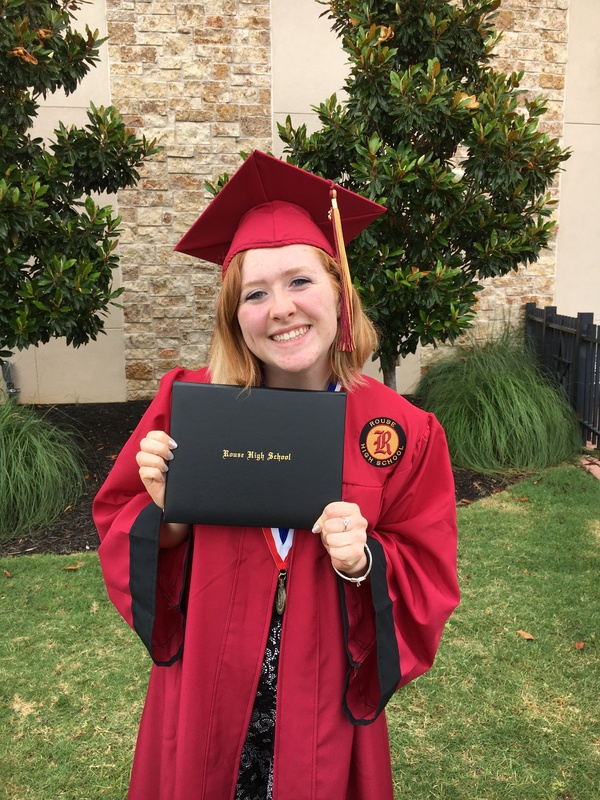 Well, her graduation has pretty much consumed my life for the last 6 weeks (really the last year). I love her & every minute spent on making this special event was worth it! 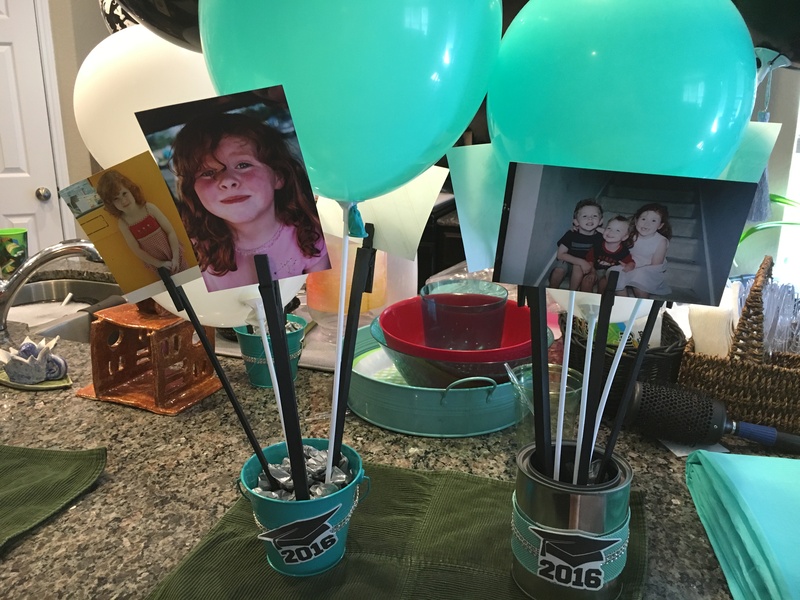 I know decorating & crafts is a departure from my normal posts, but I thought I would just a few of the decorations we made for the graduation party-maybe you might be inspired for your future graduates! 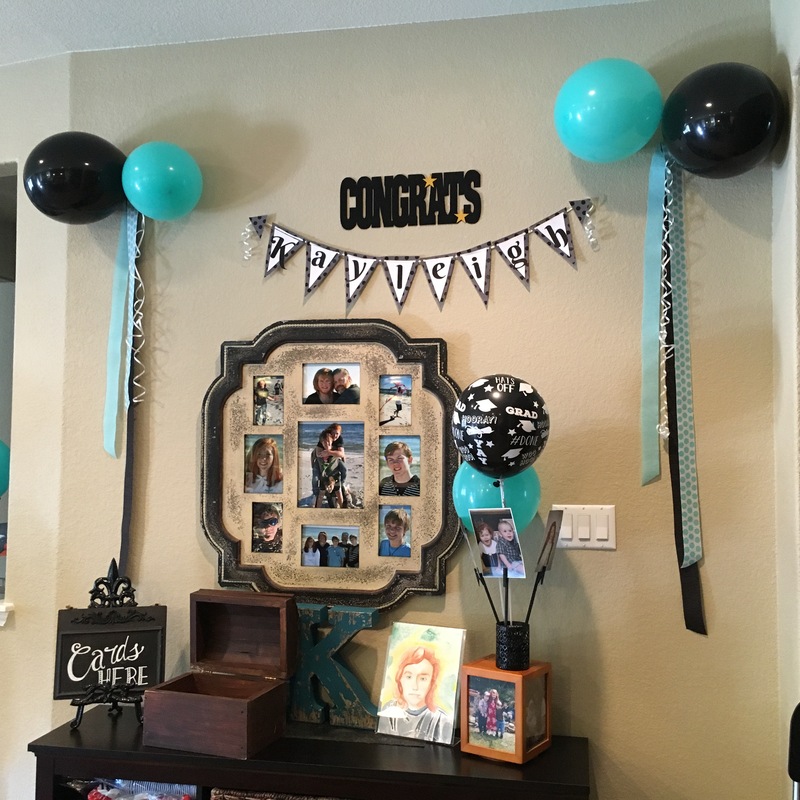 Some of these ideas came from Pinterest-check out my Graduation Ideas Pinterest Board. SUPER Easy! 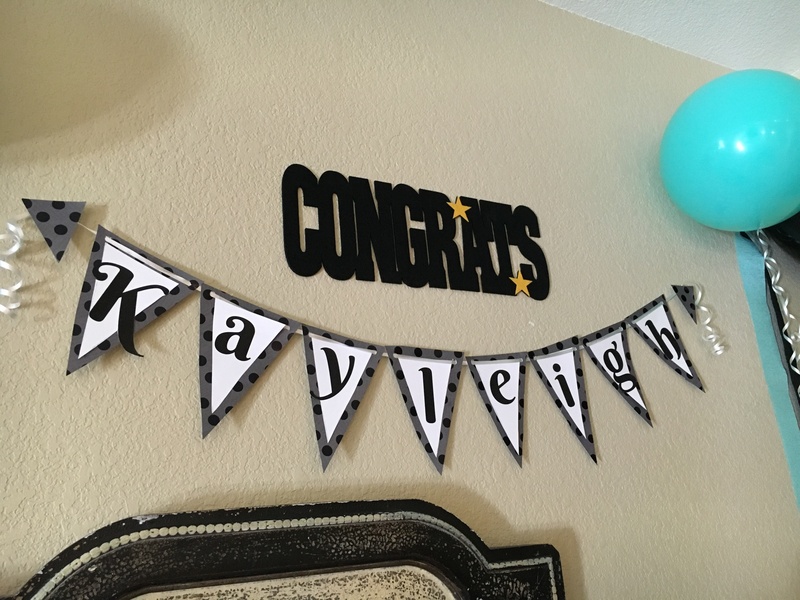 I just used some scrap booking paper & printed her name out in large letters on cardstock (leave 2-3″ between letters). 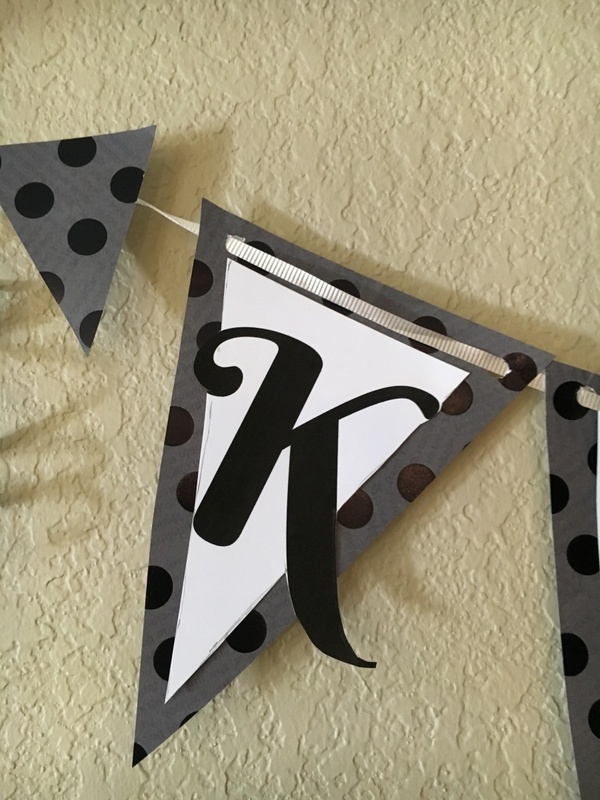 Cut the printed letters in a triangle shape about an inch smaller than the larger background triangle. Use double sided tape to attach. Punch two holes in the top corners and string ribbon through to hold it together (I also use a small bit of double sided tape to hold the letters in place on the ribbon). 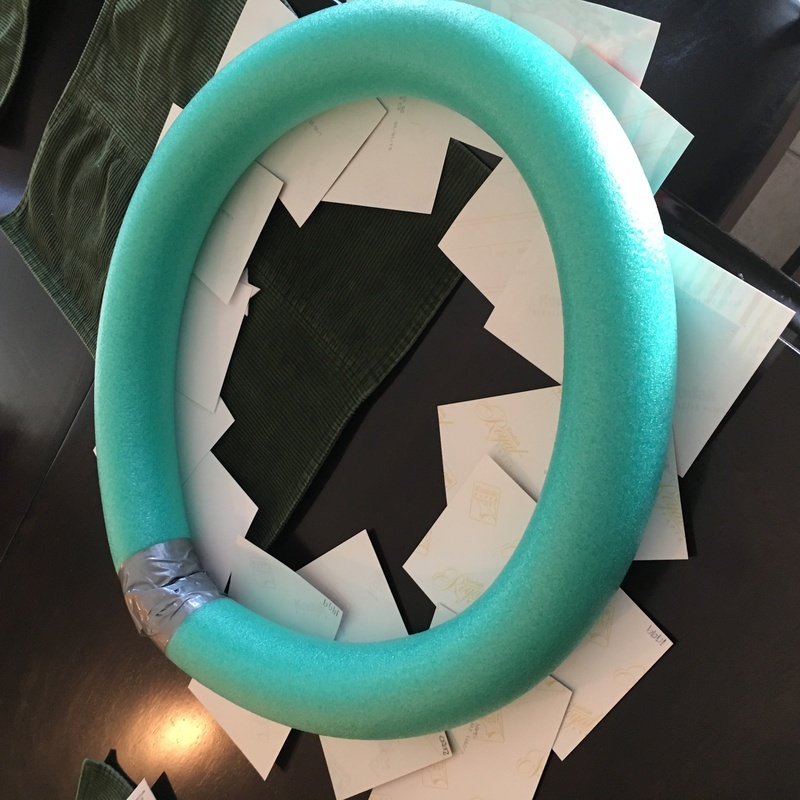 I got an inexpensive pool noodle from the Dollar Tree (the color of the noodle was one of the decorating colors so I did not cover it), duck taped it together, and used double sided tape to attach the pictures. 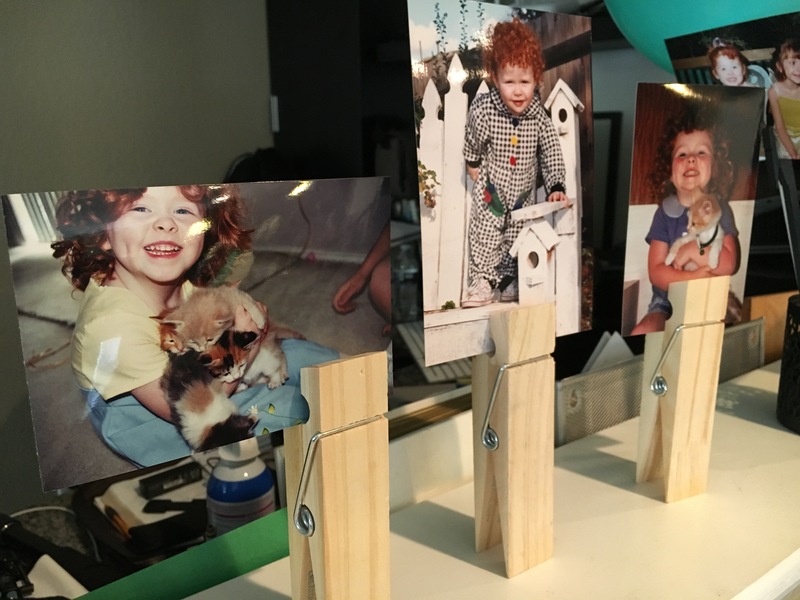 Use wood glue to attach the small clothes pins to the tops of the square dowel rods. Let dry overnight. Place floral foam in bottom of base (cut down as needed). Don’t blow balloons up to large or they will not fit. I found these on Amazon. Didn’t do anything extra to them (they could be painted or have decor/stickers added). 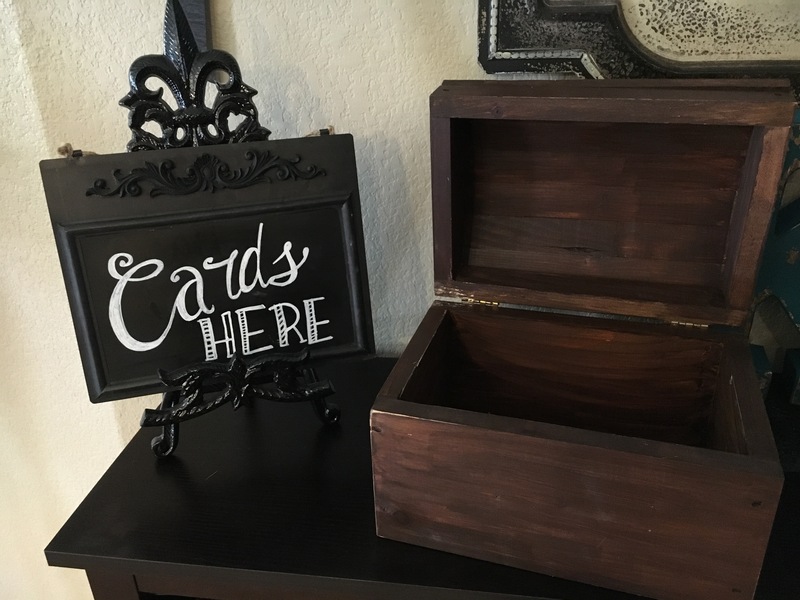 I simply used a chalk pen to write “Cards Here” on a blackboard sign and put the kids “treasure box” (we used for prizes when they were growing up) next to the sign to hold the cards. Other ideas for cards is to use old small suitcases. We asked guests to please write a Favorite Memory, a Bible Verse, or Words of Wisdom to share with our graduate. Set up a photo booth area. 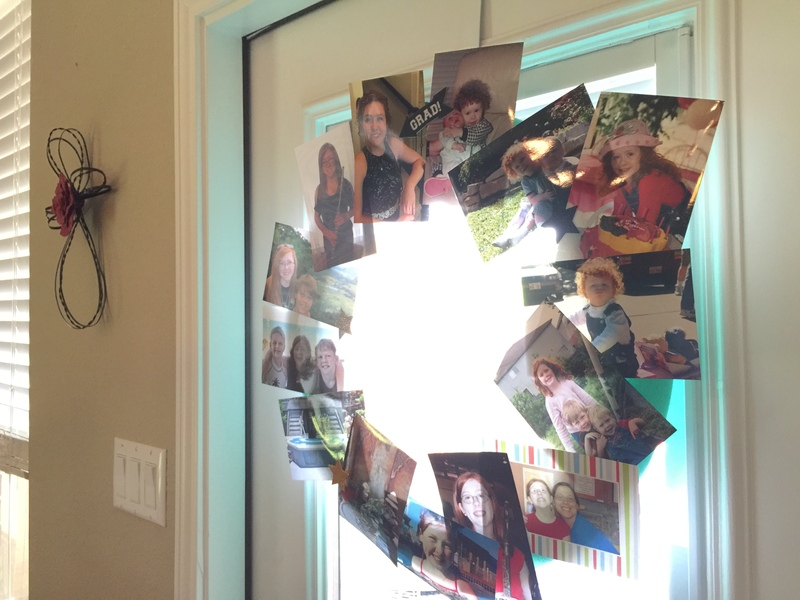 My friend’s daughter also graduated this year and she made this cute backdrop with shear curtains & Christmas lights. They had lots of fun props to take pictures with! I also made her a special “life book” from birth-present through Walgreen’s online. I was very pleased with how the book came out! (Start this MONTHS in advance-it’s not something you can whip together overnight!!) We also did a slide show of pictures (birth to graduation) playing on the TV from our computer. 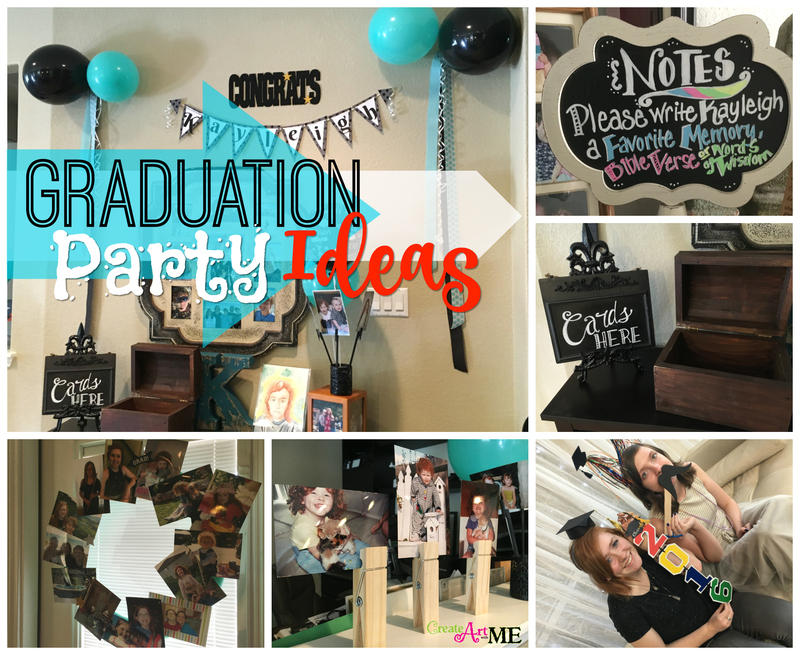 There are SO many great graduation party ideas out there! You can have a fabulous graduation party without breaking the bank-shop around, use what you have & BORROW what you need! I’m going to keep pinning to my Graduation Ideas Pinterest board-I’ve got 2 more kiddos at home & will be actively adding to this board! Students can purchase books and supplies with Amazon gift cards!